Summary for the Busy Executive: Playing well with others. Because of its customary heroic role, the trumpet gets a star part. Aside from sonatas with the piano, it doesn't often get the chance to play chamber music with anybody other than brass. The balance problems pose a hurdle, but not an insurmountable one, as this CD shows. All the items are relatively new. 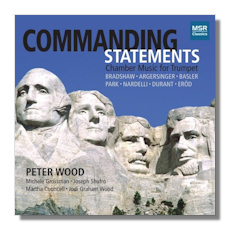 Indeed, the only previous chamber work for trumpet and small mixed ensemble I can recall right now is the Saint-Saëns septet. Wood has chosen a fairly interesting program. The figures on Mt. Rushmore supposedly inspired the four-movement Bradshaw: "Washington," "Roosevelt," "Lincoln," and "Jefferson." Bradshaw affixes quotes from each President, but I don't really see the connection. What matters is the music, rhythmically sharp and nervous. It reminds me of Lukas Foss in his neoclassic phase. Argersinger's Dream of Venus gives the composer's impressions of the massive façade Dali made for a building at the 1939 New York World's Fair. For trumpet, flute, and tape, it begins as players against a nebulous background, but it quickly acquires a firm beat and demands great rhythmic precision from the humans. Wood and Councell's synchronization astounded me. I have no idea how they locked on. As to the pertinence of the title, it depicts the composer's impressions of the Dali, not mine, but I didn't care. It's a beautiful, poetic piece, rare, may I add, in its genre. Paul Basler plays the horn and writes many works that feature it. I've done some gorgeous choral music by him, accompanied by horn. Publishers have taken up his cause. He taught briefly in Kenya on a Fulbright. Ken Bits, a diversion for trumpet and horn, recalls his time there. It consists of three movements: "Jua Kali Repairman," the mechanics throughout Africa who, of necessity, fix broken machinery with whatever's handy; "Sundowner," the slow movement; "Matatu Alert," referring to the game of bumper cars that African metropolitan traffic turns into. I especially like Basler's "car horn" splats as the drivers assert their presence. Tae Hong Park's t1 for trumpet and tape seemed to set me up for a long session, but like the Argersinger, it gelled rhythmically, this time to something like Okinawan drumming. Park, a native Korean, has lived on several continents. It could even be Korean drumming, for all I know. I think it less successful than The Dream of Venus, but it still held my interest. Nardelli, a Czech, sounds closer to classic Modernism. Dialogues is another mini-divertimento, which she composed for an American husband-and-wife duo. Perhaps because of this, there are jazz allusions in the work, although I should say they lie closer to the Dukes of Dixieland than to Charlie Parker. Still, they brought a grin to my puss. Durant's Choragus Revisited, yet another trumpet-and-tape piece, totally misfires for me. I've spent more productive time waiting to be called for jury duty. "Choragus," by the way, comes from Greek drama and means "leader of the chorus," if you care. And if you don't, come to think of it. Enjoying Life, by Austro-Hungarian Ivan Eröd, gives us a brief bonbon at the end. The title says it all. Peter Wolf plays with real musical understanding, and he's lucky in his collaborators. I wouldn't call this disc as essential as Gieseking's Debussy or Szell's Beethoven, but it does provide an intelligent amusement. Perfect Sunday afternoon listening. Copyright © 2011, Steve Schwartz.